(CBS/KIRO/AP) EVERETT, Wash. - Police were called to a home in Washington state Friday night and found a man covered in blood. He said he awoke to find his wife holding a running power saw to his neck. Officers who arrived at the home say they could hear the man shouting: "You tried to cut my head off. You're going to jail." 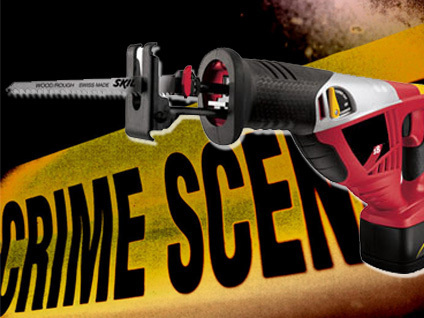 The victim said when he turned on the light, he saw his wife holding the saw. He also said his wife attacked him with a hatchet, police said, reports CBS affiliate KIRO. According to police, the man had cuts to his upper shoulder and neck. Police said when they walked into the house, they saw blood on the carpet and walls along with a bloody power saw on the bedroom floor. They also found a hatchet partially hidden on an upper shelf in the kitchen that was wet. It appeared the hatchet had been washed, reports the station. An officer interviewed the victim's wife, who said there had been an intruder who fled out of her daughter's window, but the officer said he saw the window had a child lock. That prevented it from opening more than a few inches. Police said they searched the home and found no one. The woman said she fought with the intruder and had been wounded on her forearm but police said they found no fresh marks. However, they did find dried blood on her clothes and arms that did not appear to be hers. The 43-year-old woman was arrested and booked into the Snohomish County Jail for investigation of domestic violence assault.